PERFORMED DAILY, These simple EXERCISES will help improve the suppleness of your hands and the blood circulation. These will ALSO help your hands maximise the benefits of a care product. 1. 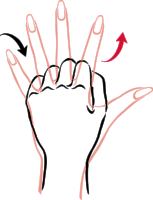 To refine fingers, grasp fingertips and push back strongly from tip to base. 2. To soften and beautify hands, join them together at the fingertips and press firmly. Relax, then repeat this movement a few times. 3. To strengthen hands, stretch and spread fingers as much as possible. Hold this position for a moment, then clench into a fist as tightly as you can. Repeat a few more times. 4. To relax hands, hold them up in front of you and let them hang loosely from the wrist. Shake gently form side to side. 5. Rest hands on flat surface. Lift up fingers, one at a time. 6. Place hands together, then separate fingers in pairs. 7. Firmly press each fingertip with your thumb. 8. Hold the left forearm firmly with the right hand and make circular motions with the left hand. Repeat with the other hand. 9. Lace fingers together, pressing one hand against the other, bend as far to the back, then as far to the front as possible. This will relax the movement of the wrist.